jewtings! :) Anything with a bitta’ Jewish in it! Today is Holocaust Memorial day, a day worldwide where we think of the atrocities of the holocaust and say “Never again”… Thinking back over the events of the last two weeks, and to the funeral of the 6 victims of the holocaust I was honoured to volunteer at, I realise how lucky I am. The majority of my family that I know of, have no direct links to the holocaust. I know of some cousins who perished in Majdanek (Thanks to the power of facebook!) but unlike many of my friends, I have no real direct link. While we say “never again” we also note that anti-Semitism is on the rise. Where I don’t have a direct link to holocaust, I do carry with me a reminder of anti-semitism everywhere I go. You see, my grandfather, was “Philip Phillips”, an odd name if you ask me. We knew the family name was Smolleransky, (I think that’s how it’s spelt) but I’d always assumed the family name had been changed when the family had come to England and my Great Grandparents were somehow clinging on. My Grandfather was born Philip Smolleransky. During the war, his Dad (My great grandfather) decided to fight for the British army… but was scared to use the name Smolleransky – Grandma’s words were “It wasn’t a good idea to go to the British army with a name like Smolleransky… you wouldn’t be accepted”…. People in England struggled to pronounce Smolleransky and used to refer to my Great Great Grandparents (are you keeping up?) as “Mr & Mrs Phillip” as my Great Great Granddad’s name was Philip…. … so through fear of anti-Semitism, the family name was changed to Phillips… My grandfather’s birth and wedding certificates say “Changed by deed poll”, and the course of our family history changed forever. It scares me, that in 2019, with the world more advanced that it ever has been… where each race knows more about each other than ever before we’ve not learnt the lessons of our recent history of 1941-1945 and anti-Semitism is back up on the rise. I don’t for one moment plan to change my name back… mainly because as a child I struggled to spell Phillips and wouldn’t want to pain my children with Smolleranksy… but I do often wonder what the world would have been like, if my Great Grandparents weren’t fearful all those years ago, and I’d been Steven Smolleransky. I didn’t fast on Yom Kippur….. Not at least traditionally. A sweeping statement yet fundamentally the truth. I’ve been thinking for a while as to what I’d do on Yom Kippur. I’ve established previously that I don’t believe in G-d…. and that I do love many of the Jewish traditions. I’ve established that although I don’t believe, I have a VERY strong connection to “my people”, to “My heritage” and to my ancestors. Yet here I am, writing this at the start of, and then adding to it during Yom Kippur (So, please excuse the differing tenses! ), the Jewish “Day of Atonement”. The day where you atone and repent for the things you have done over the last year, the one day a year where people who do little else religiously or spiritually all year round, decide they are going to withhold from eating… and I’m Drinking tea…. or maybe eating lunch. Having thought long and hard about what keeping my form of kosher means to me, and that mainly being self control, I thought in the same vain about what Yom Kippur means to me. I have never “fully” observed Yom Kippur in the Traditional Orthodox Sense, just like I’ve never kept strictly kosher. (No Use of anything electrical, no driving, no washing, no making anything… etc)… But to me, it means time spent with my family, it means time spent in Synagogue; it means being dehydrated, hungry and feeling irritable. But as well as those things, the one thing I think of, possibly the most each year as the day approaches is the time I spend Counting Time. Counting the time until the fast is over. I am the one counting the pages, before checking my watch, before recounting the pages again. My mind becomes distracted from the purpose of the day and focuses on how long until I can stop my raging headache and my tummy from rumbling. “On the tenth day of the same seventh month (Tishrei – The Month both Rosh Hashannah and Yom Kippur fall) you shall observe a sacred occasion when you shall practice self-denial” (Numbers 29:7). “Self denial”. The Torah is a little vague. Our ancestors interpreted “Self Denial” as not eating, as well as not washing, and not engaging in sexual relations. But is that a true representation of Self Denial today? For me, practically Yom Kippur is a nightmare. Practically in the sense that I am a grazer. I eat 3 meals a day, but they aren’t huge. But between the meals I’m eating. Be it sweets or chocolate, or crackers or fruit, I love to eat. I think this is partly the reason that I find Yom Kippur so difficult – because my body is expecting snacking or a cup of tea. I’ve thought for a few days as to how I can help reduce the want to graze, how to survive the fast, how to distract myself from counting pages and time to focus on the actual purpose of Yom Kippur – To make yourself a better person in the coming year. Thinking about what I could do to pass the fast, led me onto thinking as to if I actually wanted to fast. I thought long and hard at what I felt fasting would achieve and concluded that actually other than the piercing headache, hunger and distraction, personally the fast wouldn’t achieve anything potentially lasting. In my commute, I have been blessed (and when I say that, I mean it) with a solid central part of my commute being underground. Underground where the phone signal doesn’t reach. Being phoneless means I have had to find something else to pass the time. I’m thankful for this time as it has enabled me to start reading again. As the northern line rattled its merry way north, on the night before Yom Kippur I was deep in the final pages of Schindler’s Ark. Since Poland, I’ve been meaning to read it, and this commute has given me the chance to finally read it. As the train rattled out of the Tunnel toward East Finchley, I felt the customary “East Finchley Vibrate” of both my Phone and my Work phone. For the first time I found this really inconvenient. Engrossed in the book, the vibration made me anxious and it distracted me. On one hand I wanted to carry on reading, finalising the complex story I’ve been reading for weeks, yet on the other hand I was bound by the buzz to stop reading and stare at the lit screens of my phones, reading who wants to play candy crush, looking at photos of friend’s last meals before the fast or looking at emails from work. Whilst the prisoners of Zwittau , in the book, were liberated from the sub-camp that was Schindler’s factory, I was, you could say, incarcerated by the urge to stop what I was doing and flick aimlessly down social media, checking my emails and watching pointless updates about food. I am undoubtedly digitally addicted. I work in IT. I love Technology, Gadgets and things that ping buzz and light up. I am constantly checking my phone, thinking I’ve got a notification, writing messages, sending pictures and liking posts. Not a day goes by without a considerable amount of “Idle time” spent aimlessly on my phone. Even on Rosh Hashannah and previously on Yom Kippur, I’d find myself flicking aimlessly. With that in the forefront of my mind, and with the conscious realisation that for the next 24 hours I didn’t actually need my phone, at about 8pm…. I switched off. The last time I switched off, was 2 years ago. I had no choice. I was on a cruise. We were at sea. There was no signal, the phone was useless. (Lord did I try to get signal – on the top deck of the boat pointing at the land, refreshing the empty list of unavailable networks). Yet now, 8pm on the 10th October 2016, I found myself consciously choosing to switch off. Just before switching off, I was heating up my dinner. I found my-self aimlessly scrolling as per normal. Frantically scrolling through nothing. Re-looking at old posts, totting up how many likes I’d gotten here and there aggressively time wasting with no purpose. Once I’d eaten my dinner and had started washing up… it was when I had the rubber gloves on that the final straw broke this Camel’s back. I’d just put the gloves on, just run the water, when *Buzz* *Buzz*. “For Goodness sake” I muttered as I took one glove off my hand to be distracted by the glaring screen…. A spam email…. For Goodness sake” I muttered again, and decided that was enough. I’d already turned my laptop off and had set my tablet to flight mode to allow me to write without interaction. (I’m dyspraxic – it’s my version of pen and paper!!) I pressed the power button, I held the power button, and then I pressed power off. I took the currently silent iPhone from my pocket, held the power button, slid the slider and both phones were plunged into darkness. Lying in bed is a funny feeling. Firstly I noticed it’s 10:30pm. For me that’s pretty early. I am often up late reading random articles people share or chatting to friends etc. Finally I’m experiencing that myth I talk of often… an early night! Not only is the early night funny, but I’m consciously aware that normally I’d waste valuable sleeping minutes distracted by the old stale news feeds of my phones. Without the distraction, there was more time for a quick spot of reading, following which, sleep came easy! Waking up was again interesting. I overslept. Majorly. Which is odd because I had such an early night and compared to a work day was having a lie in anyway! Once I did actually wake up, my default action was to roll over and reach for my phone. On rolling over, I realised it wasn’t there and rolled over the other side and got out of bed! I decided post lie-in not to go to synagogue this morning… Arriving late at our Synagogue is a little awkward plus, by the time I got there, the morning services would be nearly over. Instead I’ve sat talking to mum who is feeling ill and I’ve done more reading and more thinking. (and a little dozing!) I’m incredibly relaxed. Frankly I’ve not missed it. I’m not craving it as much as I thought I would be…. or really at all! There was an odd time that I wanted to look something up, and a time I considered checking my phone to pass a moment of time or just to see what other people are up to. But from this I have learnt, that I don’t need to seek or give the constant approval available from having my smart phone attached to me 24×7. After getting dressed and eating some food, I decided it would be nice to go down to the hospital and visit Grandma who is currently in. Often I’d find myself sat in the room with her idly flicking through my phone whilst talking to her. Sharing my attention between two. Not today. We sat and chatted at length about all different things, giving her my full attention. Walking out the hospital I felt really good. During my visit, mum had spoken to someone there who came down to see grandma and asked me to call mum. I could have very easily taken this opportunity to turn my phone on and be met by a barrage of notifications. I made a point of not turning my phone on, but borrowing grandma’s to phone home – I knew that by turning it on, I’d become distracted and so decided to exercise higher self control to not turn it on at all! uneventful apart from the 47ish second Tekiah Gedolah Blown by my brother! I noticed that I was not interested in how many pages were left, how many minutes, or seconds… but was happy to be sat there joining in. What was exceptional was that upon leaving Synagogue, I had no urge to turn my phone on. In fact, I drove home, came in, got changed and still didn’t turn my phone on. If anything I started to feel like actually I didn’t want to turn my phone on at all. I’ve not craved my phone like I normally crave food. I didn’t really think explicitly about food. Lunch time came and I had something to eat before carrying on with my day. I’ve not been distracted by my usual distraction, and yet in removing something else, I’ve not really been distracted by that either. Removing the distractions, you could even say fasting from my phones, has allowed me to focus more on personal reflection and what I’d like to change personally in the coming year, a process that’s roots seem stem this year from my extreme reaction to some drugs in September. Removing the distraction has allowed me to focus more on talking to my family, writing this post and actually relaxing on what is supposed to be not just a day of repentance but also a day of rest. So there you have it. I didn’t fast on Yom Kippur. Not at least in the traditional sense. But maybe in a more modern sense, I’ve learnt the value of spending time without constantly seeking reinforcement through likes, I’ve learnt not to constantly need digital conversation, I’ve learnt a lot about myself, but most of all, I’ve learnt how to pass Yom Kippur without counting the pages, the hours, the minutes, the seconds, until it’s over. Today completely involved things that could be done at home…. Almost. I had a little lie in this morning, and at midday we went to Costco! So much of Costco here is the same as Costco at home… But there are some differences… Prices for example! Costco here does fuel… I worked out that the fuel here, from Costco was under 20p a litre! Crayy! From Costco we went accross to a TKMaxx style shop except it had a selection to make our TKMaxx’s look ameture…. It gave me a headache!! With that we went back home before heading for the bus… we missed the bus by about 10 seconds and Jemma very kindly chased it. The driver noticed we were following him and pulled over to let me on! The traffic was awful, but we only picked up one other person and the driver was friendly and chatted away. The people here are much friendlier! Once in town, I headed straight to the TKTS booth under the steps in Time Square and crossed my fingers. I got to the window and there were still tickets available for FIDDLER ON THE ROOF! I got the most amazing seats in the stalls at half price. What a bloody amazing production! Equal measures of laughter and tears. The characters portrayed perfectly by the actors, and as always with Fiddler, I ended up sobbing! Very few shows make me cry! After my waterworks, I wandered back through Times Square to the Port Authority Bus station… Walked right to the back for a ticket, as had now become habit, and then waited at gate 20 for the bus to whisk me back to Montclair… Which funnily enough is Sister town to Barnet! Thanks New York… You’ve been amazing. Tomorrow morning starts the next leg. Bring on the Florida Sun! To say its cold is an understatement. Freezing piercing cold is probably closer… And its set to get colder still this weekend…! Before we get on to today a quick run down on the flight…. Following a quick trip on the funky transit train from the main building to Terminal 5b, I was at my gate – as always it was the furthest gate in the building! Boarding was quick and easy and soon I found myself in the middle of the plane in one of the middle two seats. Cozy…. And we were off. I was ready with a TV plan – I knew I wanted to watch Adele at the BBC but couldn’t get the TV to work. As soon as the seatbelt light went off the guy in the row in front called the air hostess over for the very same thing…. Now, while I joke that “turning it off and on again always fixes the problem”… That’s exactly what solved it! Although that meant turning EVERYBODY’S TV system on and off… A process which took nearly 15 mins! Eventually we up and running and Adele was singing! Breakfast was as good as a hermolis airline breakfast. You do the math. I did have a good game of “Catch the coffee” during some of the turbulence… No spills! When the captain came on to say we were making our final descent and to prepare for some turbulence due to the 25-45mph cross winds, nothing could quite prepare me for what I was about to experience. At one point G forces were similar to that of a theme park ride! As it happened however, the actual landing part of landing was the smoothest I’ve ever experienced!! 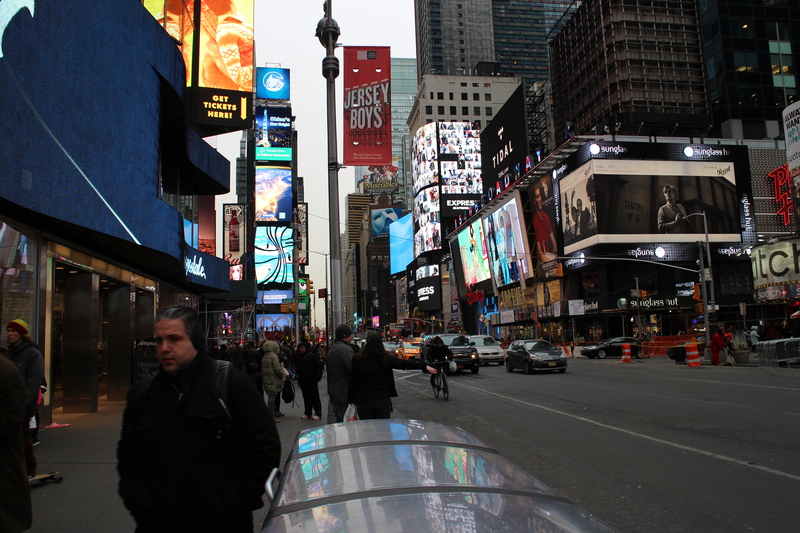 We went straight to times square for a look around. Wow! It makes Piccadilly Circus look amateur! People everywhere bright lights screens shops everything! Craziness!!! So many Screens… so many lights! From Times Sq. (with a quick stop at Cake Boss’s city shop) we got the bus to Montclair New Jersey where I’d be staying… had a mini tour of Montclair and I even go to go into Whole Foods (WOW!) before eventually heading for bed and sleeping in until 10! This morning we got the bus and headed back into town! 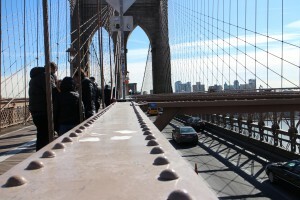 From the bus we got the subway to the Brooklyn bridge… and we walked across! Wow what a view! From the start of the walkway…. As we went further and further across the bridge the view got better and better! While talking about the view it’s probably a good time to mention that the weather today, while it looked sunny with blue skies, was actually around -8. BLOODY FREEZING. 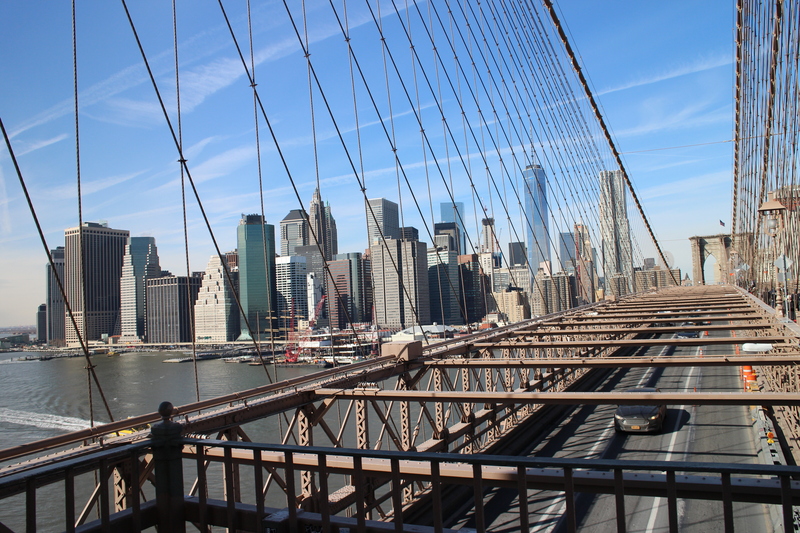 A little panorama from the Bridge. Spot the Jem! 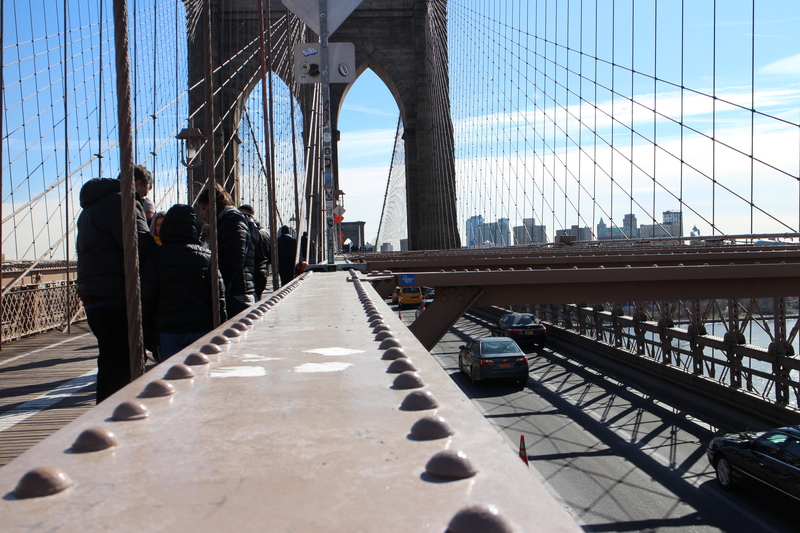 Once we got to the Brooklyn side, we were a bit clueless as to where to go… and after a little walk Googled “Jewish Deli Brooklyn”… we followed google maps and turned up (Via a quick Shpruntz Round Trader Joes.. Noch) at Shelsky’s Of Brooklyn. WOWSER. Food that I can’t explain. Sweet, Savory, Pickled, Gefitle’d you name it! We got some Rugalech and some Halva. OH MY. It was like a little corner of Jewish heaven had exploded in my mouth. The owner came over and started talking to us explaining that he wasn’t supervised kosher as it was too expensive and there wasn’t a market for it – Lots of the Jews from Brooklyn have started to move out. While we were talking some Chabadniks came in, Wished us all Good Shabbos… Asked if we’d got Shabbat Candles / Laid Tefillin today, had a chat…so friendly! From Shelsky’s we got the subway back to New York and went to Russ and Daughter’s. The wait for a table in the cafe was going to be 35 mins so we went for a walk and waited for them to text us! While we waited we walked up to Katz’s Deli. Very different to Russ… a Different sort of New York Jewish Deli. Quickly, the phone buzzed and we went back to Russ’s. Food you just can’t explain! 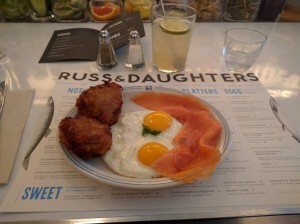 What looks like simple latke, eggs and Salmon… I can’t even begin to explain how it tasted! SO SO SO GOOD. They smoke their own fish, and make their own latkes (Not so sure about the eggs!) but boy oh boy was it delicious! I took one of the latkes to go as I couldn’t finish it! From there I was left alone in the Big Apple! (AH!) 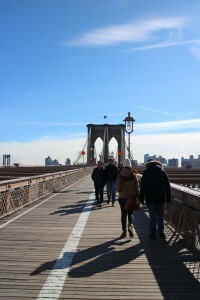 I went for a walk from the bus station to central park and then to the shopping mall – The Time Warner Center. Very nice! I had a little wander, found some free wifi, got a Cawfeee and made some calls home! From there I walked back to Times Square as I’d watched it getting dark from Starbs! 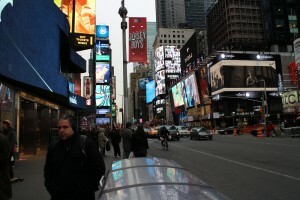 As amazing as Times Square was during the day… it was even more intense and immense at night! For those complaining of the lack so far of selfies… here’s one for you! … and a Panorama of Times Square at night! 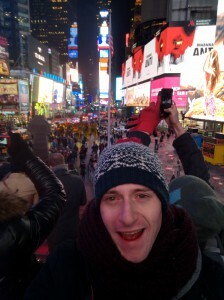 Then from Times Square, with achey legs, I made it back to the bus station, and found the correct bus back to Montclair! Thankfully the driver knew where to stop for me and soon I was back for dinner! I noticed at the Ticket Booth there was a certain musical at half price… on Broadway…. I might have to go and get a ticket… How do we keep our balance? … and on that note… it’s 11pm here… or 4am at home so I bid you all night night…. or by the time you read this… a good Saturday morning! Since Lord Sacks shared a video, “Why am I a Jew” Just before Jewish New Year, I’ve basically been thinking most of this and was going to write a blog post….. Then, just now I saw this video on my facebook home page. It’s 6 minutes long, and probably 80% just one word, But well worth a watch. One word, of only three letters, it reminds me more and more that we are one big family. To those who ‘aren’t Jew’: Watch, Learn – This is makes up what is part of the “Connection” I always fail to find the words to properly explain. To those who ‘Are Jew’, or at the very least a little “Jew-Ish”… I promise you will agree with at least one of the statements in this video! עם ישראל חי – The children of Israel Live. How Sushi has Challenged my Belief in God and Religion. Before I begin, this has been a long time coming, and I’ve thought over this a thousand times, but it’s become more poignant tonight, I think…. So I’ve been talking to someone for a while about going out for sushi, and we’ve not been able to find a time… Then, today I was about to text suggesting tomorrow when I remembered that it was Passover still. For those that don’t know, Passover is the commemoration of the exodus of the Israelites from the Egypt. When they left Egypt, they didn’t have enough time to bake bread for the journey so ate the unleavened cakes… Cast yourself forward a few thousand lifetimes – Supposedly, in a nutshell, in order to observe passover, Jews nowadays don’t consume any bread or flour based products (which could rise.).. they also don’t eat any items that expand(Peas, rice, beans…etc) … and we change all our crockery, and cutlery over to special Passover sets… clean the house from top to bottom, and even sell our “non-Passover” products to non-Jews so that we don’t own any during passover. I MUST add that we don’t all do all of the above…!!! In my house, we change the crockery and the cutlery, and we don’t consume any Flour products or any items that expand. This is where my questioning began. Where did the Israelites do this when they left Egypt… the next year, they didn’t whip out their second set of everything that they shlepped through the Desert to commemorate what they did the year before… Did they?! Further more, the extremes to which people go to in order to observer passover: “Kosher for Pesach Tea bags, Milk, Washing up liquid…” DOES SOMEONE CRUMBLE BREAD INTO NORMAL TEA BAGS/ MILK/ WASHING UP LIQUID?! 2) Increase the price by at least 15%. So, people say that you have to buy everything “Kosher for Passover” but my personal view is that, as long as there is nothing prohibited in the item, then you are ok – E.g. Where is there anything prohibited in Salmon, or ready salted crisps, or salad, or chocolate…. So according to some… by eating my crisps and chocolate, that aren’t “Kosher for Passover” I’m in contravention of the laws. But honestly, what is there that is prohibited in your normally, perfectly fine fish/chocolate?! My biggest bugbear is the custom of Kitniyot (expanding foods). As if you are Sephardi (Of Spanish or Portuguese background – sometimes including Israel) you are allowed to eat rice and beans and peas… SAYS WHO? … having done some research, it’s a bit hazy and the main consensus of the Ashkenazi (non-Spanish or Portuguese) Rabbi’s of years go by the ruling that you shouldn’t eat them where as the Sephardi ones disagree and say they are ok to be eaten on passover. I draw your attention to the word Custom. It was decided by some Rabbi’s many years ago… Does that mean it’s what god wants? Talking of God, let’s try and get back on topic (although I have SO MUCH TO SAY). I don’t observe other festivals like the weekly Sabbath or the Omer. So to Sudo Quote the Haggaddah (The service book for the Passover services) WHY IS THIS FESTIVAL DIFFERENT FROM ALL OTHER FESTIVALS? The one that annoys me the most, is the use of timer switches during the Sabbath… You are not allowed to flick the switch and create a spark… however you can know that at 6pm when it gets dark, the Timer switch will kick in and on come the lights… It’s breaking the Sabbath by proxy. I could go on all day and night about the niggles of “religion” which annoy me. However I find religion is the wrong word for the practise of what I personally do. However, I wonder how much of our heritage and practise is Tradition Opposed to how much of our heritage and practise is Religion. I know that the majority if not all of what I do, is because of the tradition… I don’t think there’s much more belief left in me. However that wont stop me from going to synagogue and singing, the songs/saying the poems (oh sorry, prayers)… or keeping kosher… and Strangely, even though my logic says that this is all crazy… I won’t be going for Sushi until after the end of Passover. EDIT: After thinking long and hard, I did actually go for sushi the night after writing this!!! !